A. For new membership application, a “Member Registration Form” must be submitted at the Association’s office. B. When applying for a status change or a new membership type, a “Member Registration Form” must be submitted at the Association’s office. A copy of an official ID must be included for age verification purposes (to be destroyed after processing). C. Students applying to become new members must submit the following documents, together with the “Member Registration Form” at the Association’s office. 1) Copy of student ID, or another document certifying student status (to be destroyed after processing). 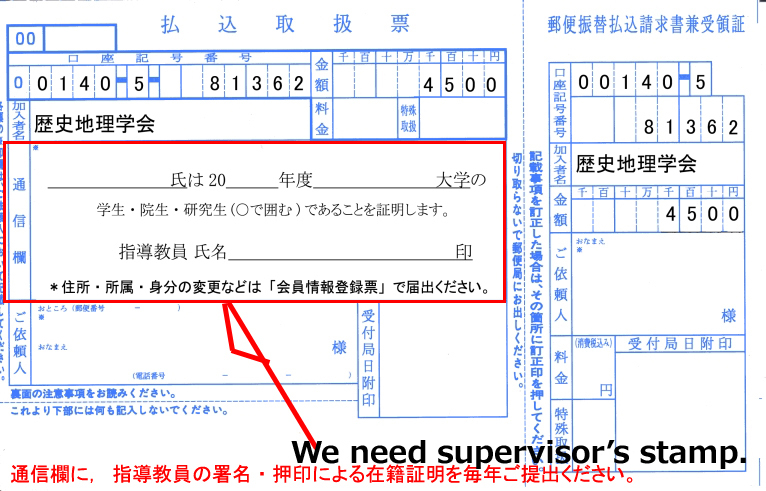 2) Discrimination of the supervisor to the "Transfer form communication field" of the student membership fee of 4,500 yen.The above procedures are submitted every year while being a student member I will.